MKV, MTS, M2TS, AVCHD, AVI, MP4, MPEGの相互変換をサポートする。Youtubeダウンロード、写真スライドショーを作成、更に動画を自由に編集できる. DVDをiPhone (3G/3GS/4/4S/5/5S/5C), iPad, Apple TV, Mac動画で再生します.高品質なエンジンを組み込まれて,画像品質が高いです. WinX DVD to iPhone RipperとWinX iPhone Video Converterのパックです. 高品質を保持するつつ動画形式をiPhone, iPad, iPod, Apple TV用ムービに変換する. このiPhoneビデオコンバータがほとんどの普通映像ファイルをサポートします, iPhone 6/6 Plus/5s/5cにAVI動画変換, iPhoneにWMV動画変換,iPhoneにFLV動画変換,iPhoneにMPEG動画変換,など.この機能によって,すべての動画をiPhoneで再生できます,いつでもどこでも楽しんでください. お好きな撮影HD動画をiPhoneへ変換できます, JVC,ソニー,パナソニックとキャノンビデオカメラのHD動画 MOD，TOD, MTS, M2TSを iPhone 6/6 Plus/5s/5c, iPad Miniへ変換するなどことです.このiPhoneビデオコンバータですべての美しい瞬間をよく保存します. 普通映像ファイルを変換できます, WMV, MPEG, FLV, AVI動画をiPhoneへ変換するなど (3G/3GS/4/4S/5/5s/5c/6/6 Plus). ほとんどのHD動画形式AVCHD (MTS, M2TS), HDTV, BDTV, H.264/MPEG-4 AVC , MKVなどをiPhone 4/4S/5/5s/5c/6/6 Plusへ変換できます. JVC (*.mod, *.tod), ソニー(*.mts, *.m2ts), パナソニックとキャノンビデオカメラのHD動画をiPhone 4/4S/5/5s/5c/6/6 Plusへ変換できます. 出力保存先のAppleデバイスを選択して,自由に iPhone, iPad, Apple TV, Apple TV HD, iTunes, Mac用通常形式へ動画を変換します. "RUNボタンを押して, WinX iPhone Video Converterがあなたに速い変換スピードと高い動画品質をもたらす. 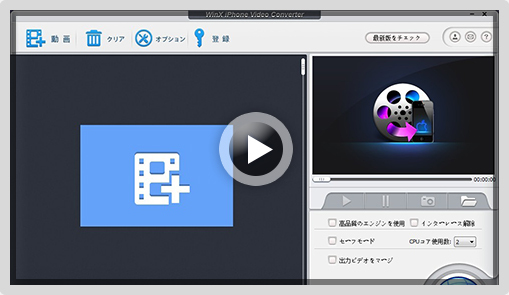 もし,あなたのiPhone （iPad, Apple TV, iTunes)でMKV, M2TS, AVCHD, MODなど映像ファイルを再生できないなら, WinX iPhone Video Converterを利用して,iPhoneに互換性がある映像ファイルへ変換して,動画再生できます. 更に,このソフトウェアが自動的に不正な映画データを修正できます。画面アスペクト比など。それからスムーズに映像を転換して楽しめます. 複数のCPUを持っていれば, WinX iPhone Video Converterが"CPU Core Use"（最大８コアまで）の設定をサポートしています,変換スピードをアップさせます. I'm delighted by your iPhone video converter, for it is such an effort-saving program to none tech aware user like me. I'm also glad with its ordered and clear interface. It makes the operation easier. Thank you. You really did a good job. Best iPhone Video Converter. Supports AVCHD, WMV, AVI, it means, with this software, I can put any video into my iPhone. And, in fact, it also works well. My iPhone had been a palm cinema with the help of WinX iPhone Video Converter. That is great! Nice program. It works as it states on the web site. Very easy to use and it converts my self-shot videos to iPhone with good quality. My camcorder is JVC's. What's more, the speed is fast enough. Youtube is the widely used video sharing website and it brings much fun to our life. It supports FLV format videos. So with WinX iPhone Video Converter which supports convert FLV to iPhone, you can easily enjoying Youtube videos on your iPhone. How to Convert Videos to iPhone, the New iPad, iPad Mini, Apple TV? 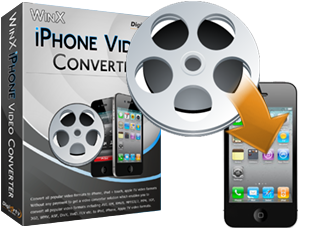 WinX iPhone Video Converter enables you to convert videos to iPhone, but also other Apple devices such as the New iPad, iPad Mini, Apple TV. It converts AVI, FLV, MP4, MPEG, FLV, M2TS, MKV to iPhone, iPad Mini, Apple TV. How to Convert HD Video to AVI? Some media players don’t support HD videos. AVI is the most common video format. So an HD video to AVI converter is necessary. WinX HD Video Converter Deluxe converts AVCHD (MTS, M2TS), BDTV, HDTV, multi-track MKV to AVI.